We've put this keyboard through rigorous testing and could not destroy it. We've tried to rip, tear, pull and yank the keyboard but it held up. We even took it to an extreme and ran it over with automobiles and machinery and guess what, it still worked. So while we do not recommend that you try to destroy it, you can see that it should be able to handle any environment where you need a portable, waterproof, flexible keyboard. Twist it, roll it, fold it, soak it. 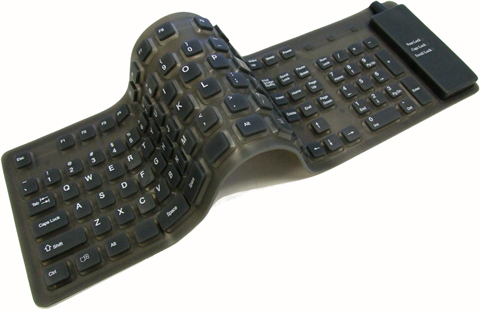 The all new Flexible Full Sized Keyboard from Adesso is a revolutionary approach to truly taking PC computing anywhere. It’s water resistant, flexible, and dust and contaminant proof. The keyboard is great for use in industrial environments, hospitals, libraries, and marine and boating applications. The silicon based material is impervious to almost anything and, it’s fun to use. IBM AT, USB & PS/2 compatible. Easy connection to USB and PS/2 ports. 17.7" x 5" x 0.5"
19.75" x 6" x 1.5"